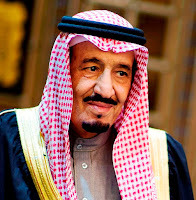 RIYADH, SAUDI ARABIA (The Nil Admirari) - A date between President Barack Obama and Saudi Arabia's King Salman bin Abdulaziz Al Saud was cancelled at the last minute by King Salman. Friends of Saudi Arabia say Salman is more than a little jealous and very unhappy about how much time the United States is spending with Iran. The United States finds itself trying to reach a nuclear agreement with Iran while it helps Saudi Arabia launch airstrikes against Iran-backed rebels in Yemen. A press conference held this morning in Riyadh made it clear how hurt King Salman was that he had to compete for Obama's attention. "The U.S. has been giving Iran so much more attention lately there seems to be so little left for Saudi Arabia," lamented King Salman. He shook his head before continuing, "And now I hear from our friends that the United States is spending even more time with Iran to fight ISIS in Iraq and Syria." President Obama tried to reassure King Salman the United States had more than enough love and attention to go around. "The United States can chew gum and walk at the same time, and our relationship with Saudi Arabia is more important to us than ever. And to prove it I am sending Saudi Arabia another $1.5 million in aid and two dozen new F-15 jets," stated Obama. King Salman accepted Obama's gifts, but remained skeptical about the relationship. "I don't know. It may be best to take a break from each other. George W. Bush knew how to make Saudi Arabia feel special and Obama is no George W. Bush," stated Salman.